Expert consultation and ideas to solve your ballfield problems. Low prices on Pro's Choice products, thanks to direct shipping from the factory to your park. Our goal: provide the highest quality field at the lowest possible price! It's all here - just give us a call or send an email. 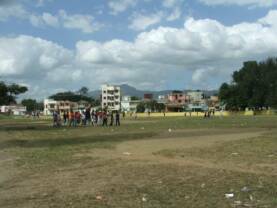 A baseball field in San Pedro de Macoris, Dominican Republic, the birthplace of many MLB shortstops. The field could use some Pro's Choice products.